I love to crochet and watch creations grow. I sometimes resent Tim I have to make for other things like sleeping. Husband says I snore while crocheting. I know I have to frog in the mornings but can’t see doing crocheting while sleeping. I’m proudly married to a Vietnam vet. Just had our 50thannivetsary. Glad to see so many crochet! I need a pattern to crochet the Tigger hat , from Winnie the pooh, does anyone out there know where I can find one? Ty in advance. 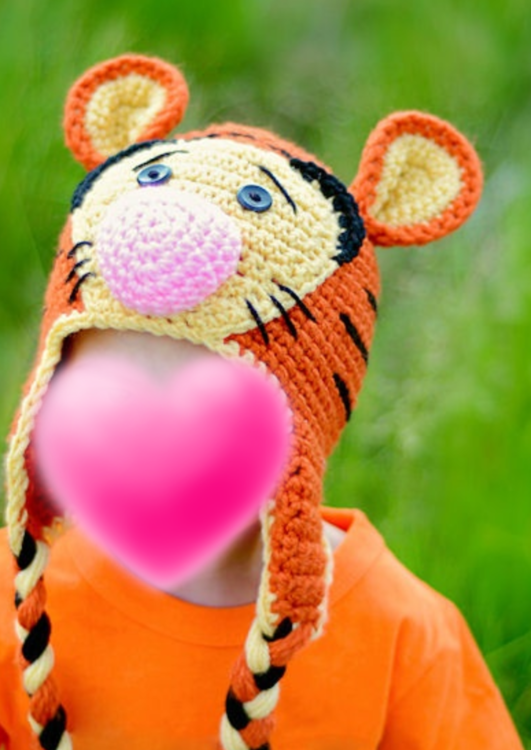 I went and typed in Pinterest/free/crochet/child’s tiger hat pattern and on the second line of pictures was the very one you asked for. Now download when you get there and print it off. I love being a detective. You live in a beautiful country. Went there as a companion for a woman who couldn't go alone. I found out why her family didn't want to be with her.i swore I'd go back some day when I could enjoy myself. Haven't made it yet. I have a very good friend who moved back to Michigan 1 & 1/2 years ago. She worried about her dad who lives in Detroit. They bought a big fixer upper north of there. She misses out here so much. We have no kids. We’ll leave our place to her. villager, did you find instructions for your hat? Mary jo, do you have a home for your babies? I have a friend who works for Dept. Chil. Ser...transporting kids to appts to see parents then back to foster. I am gong to make her a bunch of animals to give kids who need something to hug. My aunt used to make her raggedy Anne & Andy to give out. Under your name saw where Villager was looking for pattern for tiger hat. Saw exact pattern on Pinterest. Please give my thanks to your husband for his service! I had 3 brothers in the WWII and one in Korea.